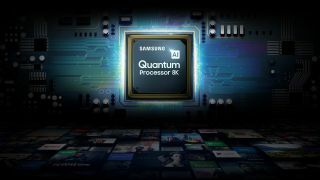 Samsung might have begun its AI experiments with last year's Samsung Q900 8K QLED TV, but at CES 2019 the South Korean electronics maker has revealed plans to take machine learning to the next level. Specifically, Samsung will expand its AI's capabilities to improve Bixby, the sound quality of its TV's built-in speakers, and Tizen, its smart TV platform. In 2019, users will be able to ask Bixby questions, and it will use context awareness to automatically adjust answers based on a specific question. Bixby will also be able to integrate with an intelligent home, allowing it to control Samsung devices, other Internet-of-Things (IoT) devices, and life-on-demand services. AI Sound, on the other hand, uses spatial awareness technology to analyze and adapt the audio to create the best experience based on the settings and location of the TV. It also applies scenic intelligence technology to analyze each scene (news, sports, game etc.) in real time and adjust the audio accordingly. Samsung had previously used metadata to apply sonic processing in its TVs, but the addition of AI technology gives its 2019 models the ability to enhance and optimize audio based on analyzing sounds in real time. Finally, TV Plus will now use the AI built into Samsung’s smart platform to enable the TV to discover new content based on a person’s viewing habits, then make recommendations for its users. Originally, when Samsung started talking about TV AI at last year's CES, it was focused almost solely on its intention to improve image processing – especially on 8K TVs where significantly more picture processing is required in the upscaling process. How it did that was by analyzing images constantly and building a comprehensive database that uses learning algorithms to incrementally improve the image processing. The company then regularly updates the database on the TV itself with the latest formula bank, thus allowing the upscaling to deliver the best possible images. The processing not only upscales the image, but also applies texture creation, noise reduction, and edge restoration to take full advantage of the 8K panel. This year, however, AI isn’t just being used to improve the quality of the upscaling on Samsung TVs – the manufacturer is committed to applying the same machine learning techniques to other aspects of its TV’s performance. If the idea of a smarter TV sounds scary, don't get too worked up – there’s little danger of your Samsung TV becoming self-aware. According to Samsung, the purpose of these AI improvements are to allow Samsung TVs to get smarter by the day, with AI helping to improve the picture and sound quality, while making the smart experience as rewarding as possible. That's a robot revolution we can really get behind.